Nestled among eight connecting glacial lakes, Oakwood Lakes State Park provides a never-ending variety of activities throughout the year, from hiking and swimming, to ice fishing and cross-country skiing. Shaded campgrounds and picnic areas complement the park's excellent swimming and boating facilities. Plan to stay either at a campsite, with or without electricity, in a cozy one-room cabin or in horse camp. The reservation process is quick and secure with the online system. 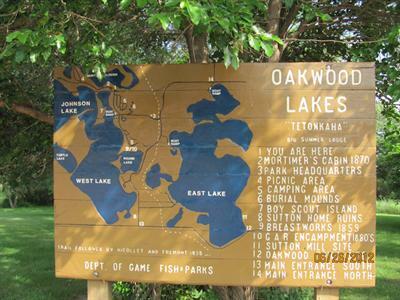 Guests at Oakwood Lakes State Park enjoy such amenities as the beach, boat ramp, showers, playground and picnic shelter. 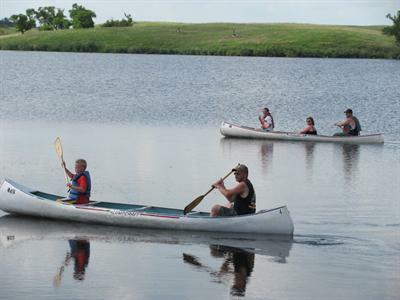 Canoes and kayaks can be rented for gliding along on the water. For fishermen eager to pull in walleye, perch, northern pike and bullheads, a fishing dock is proved along with fishing poles to check out for use at the park. Oakwood Lakes State Park was once used as a summer camp and an annual gathering spot for American Indians. Later, Samuel Mortimer arrived in 1869 and built the log cabin that still stands at the park. The visitor center showcases an archeology display of items found in the area. Nice, relaxing setting, with plenty of intriguing sites to see and explore. Visited October 11-14 weather was cool and windy but fall colors were nice. Hope to come back when weather nicer to do more kayaking and fishing. We really like this park. We look forward to visiting when we can. Oakwood Lakes is a a quiet, neatly defined state park near Brookings, SD. The two campgrounds provided a choice of open and expansive or beautifully mature treed campsites. There are a number of short hiking trails through prairie or along the lakes. There is a beautiful sunset overlook with a description of an Indian legend that adds some sense of history to the area. 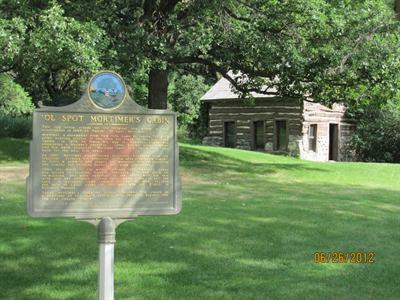 “Mortimer’s Cabin” is another bit of history about the area in the 1800s when fur bearing animals were plenty. The park staff are very personable and enjoy engaging campers. The “service” rating indicated is simply that it was cold and rainy and there were no services to consider, given that October is the off season for lake activities. I recommend this park for anyone who wants some quiet time with perhaps some fishing or canoe/kayak activity on the lakes.